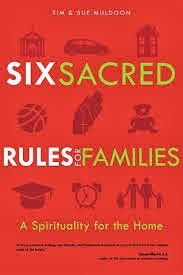 The six rules they have established for use in their own family of three adopted children, and which they share on these pages, are based on St. Ignatius of Loyola’s “The Spiritual Exercises.” Those rules are: 1) God brings our family together on pilgrimage, 2) Our love for one another leads to joy, 3) Our family doesn’t care about ‘success,’ 4) God stretches our family toward his kingdom, 5) God will help us, and 6) We must learn which desires lead us to freedom. The Muldoons then examine each of the six rules, offering concrete examples of how these rules are put into practice in their own family life. The last part of the book offers four examples of lectio divina that can be used with a family and the lesson that those stories contain for family life. The biblical stories that are examined are those of Zaccheus, The Prodigal Son, The Good Samaritan, and The Wedding at Cana. There is also a section on discernment and reasons why going to Church is important. 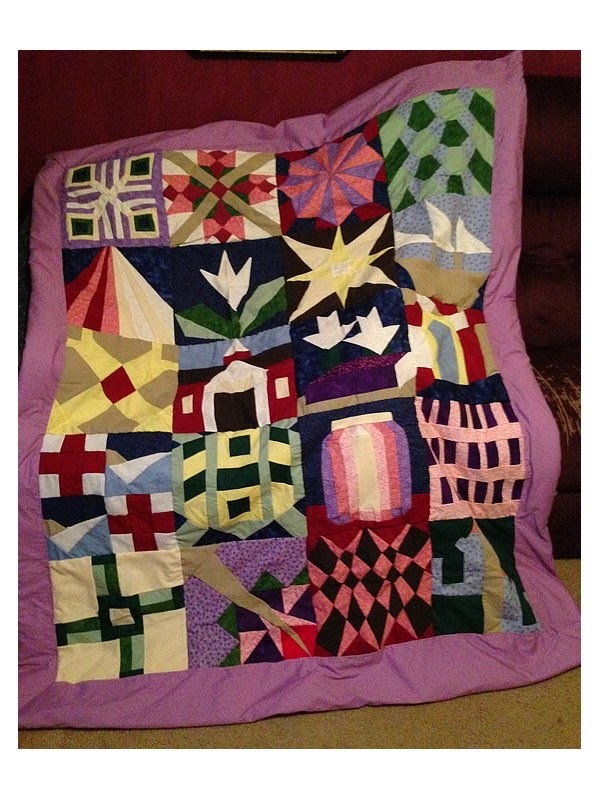 The Patron Saint Quilt is Done! In the late 1970s and early 1980s, photographer Robert Flischel was busy photographing weddings and religious services in Ohio and Northern Kentucky. As he did so, he felt an increased desire to examine the beautiful spaces and share that beauty with others “with a goal of telling a clear and meaningful story.” The result of that goal is the breathtaking coffee table book, Messages of Glory: The Narrative Art of Roman Catholicism. The images are divided into categories, beginning with angels, then moving to saints, beatitudes, sacraments, symbols and icons, the stations of the cross, the life of Mary, mysteries of the rosary, the holy family, and the life of Christ. All serve to teach and inspire. All could be a source for meditative prayer. From an artistic perspective, the craftsmanship of these pieces is amazing, and something we often take for granted. We walk into a Church and expect to see beautiful windows and statues and give little thought to the artists and craftspeople who put so much of their heart and time into creating them so that they might give glory to God. One story worth sharing in this text concerns the Angels of Cincinnatti. They are two European sculptures brought to Cincinnatti in the 1840s for St. Peter in Chains Cathedral. In the 1850s, they were moved to St. Teresa of Avila Church. In the 1960s, it was decided that they no longer fit the style of the church and were relegated to life behind a curtain in the parish bingo hall. In the 1990s they were rediscovered when the diocese requested an art inventory. They are now on loan to the Cincinnati Art Museum and getting the attention such fine pieces of sculpture deserve. 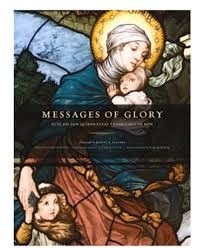 “Messages of Glory” is inspiring. It would be wonderful if other photographers took on the challenge of preserving the art of other dioceses. Much of this liturgical art is at risk due to parish closings and the simple passage of time. It is worth recording from a historic, artistic, and spiritual perspective in order that future generations may also benefit from it. 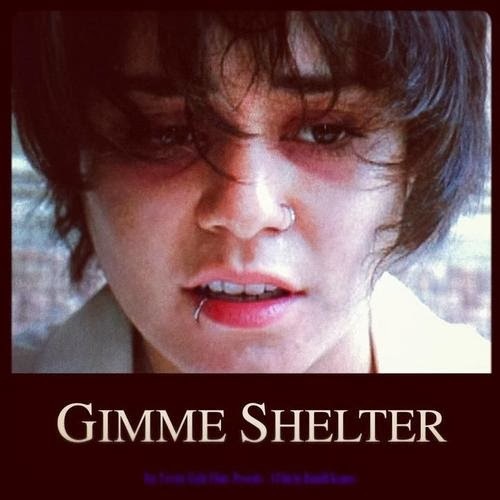 A pregnant teenager flees life with her drug-addicted mother and ends up living on the street before being welcomed into her first real home in Gimme Shelter, an extraordinary tale of survival and redemption inspired by actual events. For 16-year-old Agnes "Apple" Bailey (Vanessa Hudgens), life has been a constant struggle to overcome the harsh reality of a subsistence existence with her abusive mother, June (Rosario Dawson), and June's string of lowlife boyfriends. When she finds herself pregnant and alone, Apple temporarily takes shelter with her biological father, Tom (Brendan Fraser), a wealthy Wall Streeter living in a New Jersey mansion with his wife Joanna (Stephanie Szostak) and two young children. But Apple's inability to adjust to her new circumstances, and her refusal to terminate her pregnancy, soon force her back onto the streets. Desperate to find a haven for herself and her unborn child, Apple reluctantly agrees to move into a suburban shelter that houses other pregnant teens. Emotionally scarred and unable to trust those who want to help her, it seems unlikely that Apple will be able to adapt to the shelter's strict rules and high expectations. With her safety and that of her unborn child at risk, Apple must find a way to break the shackles of her unhappy past and embrace the future with clarity, maturity and hope. Inspired by the real-life, David-and-Goliath story of Several Sources Shelters founder Kathy DiFiore, award-winning writer and director Ronald Krauss wrote his original screenplay while spending a year in a shelter for pregnant teens, and based his poignant screenplay on the lives of several of the shelter mothers. Gimme Shelter stars Vanessa Hudgens (High School Musical franchise, Machete Kills), Rosario Dawson (Sin City, Trance), Brendan Fraser (Crash, The Mummy), James Earl Jones (The Great White Hope, Star Wars franchise), Ann Dowd (Compliance, Side Effects) and Dascha Polanco ("Orange is the New Black"). Also appearing in the film are several real life shelter mothers, their babies and Kathy DiFiore. The film is produced by Krauss and Jeff Rice (End of Watch, 2 Guns). Director of photography is Alain Marcoen (The Kid with a Bike, She is Not Crying, She is Singing). Production designer is William Ladd Skinner (This is the End, Pirates of the Caribbean franchise). Costume designer is Ciera Wells (All is Bright, Damsels in Distress). Executive producers are Paul Hellerman (Pulp Fiction, The Mexican) and Scott Steindorff (The Lincoln Lawyer, The Human Stain). Among the vulnerable for whom the Church wishes to care with particular love and concern are unborn children, the most defenseless and innocent among us. Nowadays efforts are made to deny them their human dignity and to do with them whatever one pleases, taking their lives and passing laws preventing anyone from standing in the way of this. . . . Yet this defense of unborn life is closely linked to the defense of each and every other human right. It involves the conviction that a human being is always sacred and inviolable, in any situation and at every stage of development. . . .
Reason alone is sufficient to recognize the inviolable value of each single life, but if we all look at the issue from the standpoint of faith, "every violation of the personal dignity of the human being cries out in vengeance to God and is an offense against the creator of the individual." I've always known that I was an introvert. I'm like my father, who has always embodied a strong, silent persona. I think that because I had him as a role model, I never thought myself strange or different. I just was. I always had a few close friends, but I also liked being alone. I found solace in books and art and writing. I didn't realize everybody else didn't share my love of these things. As I've gotten older and learned more about the differences in extroverts and introverts, I have definitely found the study interesting. God likes variety, and just as he created male and female radically different, he created introverts and extroverts to make life interesting. After all, who would all those extroverts talk to if there were no introverts? And a room full of introverts is definitely a quiet room filled with awkward pauses.A few extroverts certainly help keep the conversation flowing. That being said, two introverts who care about each other can have a very deep, meaningful conversation. I know that there are extroverted writers and artists, but they are a minority. Without us introverts contemplating life so deeply and recording it, cultural development would definitely slow down. The world needs both kinds of people. I guess I've never felt put upon as an introvert -I've just been. Maybe that's not the norm. The Introvert's Way: Living a Quiet Life in a Noisy World by Sophia Dembling seems to have been written for introverts who have had enough and aren't going to take it anymore! It makes the case that introverts are 50% of the world's population and that we need to stake our claim in it. Truthfully, I hadn't realized we hadn't. Still, I found the book interesting and fun. It confirmed that I am a "normal" introvert and I laughed when Dembling referred to audience participation at a theater production as "hell" and discussed the pain of group projects. Please, please - just give me an assignment and let me do it! I'll gladly work with others as long as my role is clearly identified and I can go work on it. My dislike of the telephone is apparently also shared by others. Who are all those people talking to on their cell phones for hours and about what? I just don't understand. My cell phone suffers from neglect. When I have to make a phone call, even to people I love, I have to psych myself up for it. I love email and FB messages. If I had a phone that texted, I'd probably love that, too. I like parties, but they exhaust me. The holidays wear me out. I am not alone - apparently many people feel this way. We can act extroverted when necessary, but that takes a lot of energy as well. (Interestingly, though - according to this book - it takes more energy for an extroverted person to act introverted). I also found it interesting that introverts may actually think a little slower than extroverts because we process on a deeper level, which is one reason we find group conversations difficult. By the time we have processed the comment and what we want to say, the group has moved on to something else. I can't tell you how often this has happened to me. Or - I do have something to say, but I'll over-analyze before I speak. "Should I say that? Does it have something valuable to add? Oh well, I'll just sit here and be quiet. Maybe I'll blog about it later." Although, truly, I analyze my blog posts the same way. The world is noisy enough - I don't need to add to it without reason. 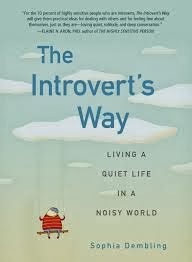 "The Introvert's Way" is an interesting read for introverts and for the extroverts who love us. It is also good for extroverted parents of introverted children (or vice versa). It is good to know how the other half thinks and functions. 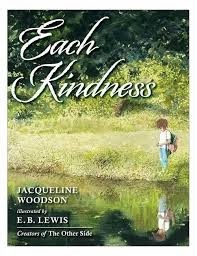 I picked up Each Kindness by Jacqueline Woodson, a winner of a Coretta Scott King Honor, while browsing in the children's section of my local library. I expected a feel-good story about being kind. This is not a feel-good story - this is heartbreaking, but definitely worth reading, even as an adult. The story is told by a little girl, maybe eight or nine years old. She shares how a new girl named Maya came to her class. She was different, poor, with clothes that were different and games that were different. Maya tried to be friends with the other kids, but they rejected her every time. The other girls called her "Never New" because all she owned was second-hand. The teacher gives a lesson on kindness, on being the pebble in the water that sends out ripples. The narrator realizes that she has not been kind, but it is too late. Maya never returns to school. Her opportunity for kindness to the different new girl has passed, and she must live with that regret. It's a powerful message. Yes, I'm sure on some level it is meant to be an anti-bullying book, but it is also a reminder for each of us who don't necessarily bully anybody, but who sometimes fail to be kind. Once that opportunity is wasted, it can never be reclaimed. Everybody can benefit from kindness. It is an important thing to remember and put into practice. I was flipping through Forbes Magazine the other day (I have an eclectic choice of reading material) and was surprised to come across an editorial by Steve Forbes titled "HitlerCare." Belgium is on its way to allowing doctors, with parental consent, to kill children deemed to be afflicted with “constant and unbearable physical suffering.” The kids must also sign off on this, as if a child has the capacity to reason like an adult. We are on the malignantly slippery slope to becoming a society like that envisioned by Nazi Germany, one in which “undesirables” are disposed of like used tissue. While the Nazis carried this ideology of death to its ghastly logical conclusion, the belief that it would be good for the human race to improve itself–as breeders do with horses, dogs, cows and other animals and plants–was also widespread in numerous other countries before WWII, including the U.S. It was called eugenics, and under its banner countless hundreds of thousands of people, particularly those deemed mentally handicapped, were forcibly sterilized to prevent them from fathering or birthing children. Before the war Nazi Germany killed upwards of 8,000 children judged to be “mentally deficient” or incurably ill.. . .
As euthanasia becomes more accepted–and we become more numb to the horror of murdering people like this–we’ll descend to the next abomination: pressuring the sick to discontinue treatment for a likely fatal illness in the name of “saving scarce resources” for people who have more years ahead of them. After all, an enormous percentage of medical costs are wracked up by people who have less than six months to live. Britain already has its own version of a death panel, which has a formula for determining who gets expensive treatment and who doesn’t. Let’s be clear. We’re not talking about adults deciding they don’t want “heroic” methods applied when they’re suffering a fatal illness; we’re talking about the conscious taking of a life by people who are trained to cure us of illness. The true mark of a civilization is in how it treats its most vulnerable members. For a long time, I've been a fan of the show Parenthood. It's definitely an adult-themed program, but I can relate to it quite a bit. One of the key characters is a teen named Max, who has Aspergers. The show manages to make the portrayal of living with Aspergers both accurate and funny. I spend a lot of time laughing because his parents have the same conversations with him that we have had with our older two boys (one definitely Aspie; the second borderline). I assure you these conversations are much funnier to watch than they are to have, but it's good to be able to laugh about what can be a very challenging situation. One of my favorite scenes earlier this season involved Max giving his Mom $20 to support her mayoral campaign. After his mother gets over the shock, she asks him where he got $20 from. He says that his father told him if he would just "shut up" for one hour, he would pay him $20! This can only be truly appreciated by someone who has had an Aspie talk to them for HOURS on a subject of absolutely no interest to them. Also this season, Max has formed a friendship with Hank, a photographer played by Ray Romano. Anyone familiar with Aspergers has had Hank pegged as a Aspie for a while now, but as a forty-something he's never been diagnosed or even known about it. But Max had a meltdown in his presence, and Max's father gave Hank a book about Aspergers so that he can better understand. As Hank reads it, he recognizes himself. It will be interesting to find out how this will impact his character. I really love this program for making Aspergers real to many people who might not otherwise be exposed to the issues related to it. I also appreciate that it makes me laugh! Do you believe in miracles? "The Chance" by Karen Kingsbury is all about coincidences and miracles (are there really any coincidences with God?). 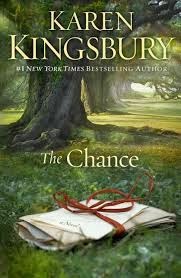 Kingsbury is one of Christian Fiction's most loved and best-selling writers and with good reason. She is a great story-teller with the ability to tie Christian faith into a story without being overly preachy. This tale focuses on Ellie Tucker and Nolan Cook. The two were best friends as children and secretly in love with each other as teenagers, although they never admitted it to each other. When Ellie's family falls apart and her father makes her move across the country, Ellie and Nolan write each other letters and bury them - promising to return eleven years later to dig them up and read them. Eleven years has brought a great deal of heartache. Nolan's dream of becoming an NBA player has come true but he's never forgotten the young girl he gave his heart to. He's tried everything to find her and come up empty, but he just can't move on. Ellie made some poor choices, changed her name, and made herself impossible to find. She still loves Nolan but feels he would be ashamed of her or feel sorry for her. The last thing she wants is anyone's pity. A secondary story focuses on Ellie's parents. Kingsbury seems to realize that this story does push the credibility envelope a bit - the story itself refers to how improbable it all seems, but it is fiction after all, and it is good to believe that miracles can happen. "the Chance" a great leisure-reading book for those who enjoy romantic happy endings. 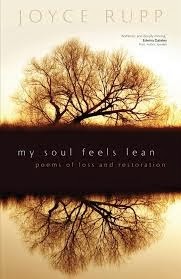 My Soul Feels Lean: Poems of Loss and Restoration by Sr. Joyce Rupp has been sitting in my to-be-read pile for quite a while, but often I have found when that happens that I pick up the book right when I need it. This was one of those times. This is a book made for winter - the physical season of desolation, and more importantly, the spiritual season of emptiness. With 106 meditative poems, Sr. Rupp, well-known as a writer, retreat leader, and conference speaker as well as being a Servant of Mary, tackles the themes of loneliness, fear, grief, disenchantment, mental illness, poverty, and sorrow. Sr. Rupp writes, "Loss is a natural occurrence in the flow of life. This reality implies the necessity and willingness to bid farewell to those who leave, to shed what no longer fits the shape of life, to let fall away those aspects of self that fail to enable growth, to skim off the details of the persona that keep one tethered to a false security." The book is divided into two sections: "Loss" and "Restoration." While the first section focuses on pain, the second offers a glimpse of spring coming onto the horizon. It is the foundation of nature and of Christian hope - the cycle of life, death, and resurrection. "We won't be able to reestablish what we once had but we will receive some new seed of growth to take us farther on the road of personal transformation." Sr. Rupp's poetry is beautiful and thought-provoking. Many moved me to tears. All were worth spending time with. Pope Francis on Sunday, December 29th, invited the faithful to join him spiritually in prayer for the upcoming Concistory and for the next Synod of Bishops which will focus on the theme of the Family. Tonight on Facebook, Danielle Bean shared a rejection letter she had received from Catholic Digest in 2002. The irony? Today she is the editor-in-chief of that publication. I have a smaller scale story of irony. When I was in college, I wanted to go to graduate school for history. My first choice? Notre Dame in Indiana. I wanted to go there with all of my heart - it was an esteemed institution with a great history program, and it would have given me a chance to get away and experience life in a new place (I've lived my whole life within a 20 mile radius). Alas, despite my high GRE scores and grade point and a letter of recommendation from a history professor who was a Notre Dame alum, it was not to be. I still have my rejection letter. Fast forward fifteen years and I was offered a contract for The Catholic Baby Name Book by Ave Maria Press, which was founded by the same priest who started the University of Notre Dame and is also based in South Bend, Indiana. Ah yes, God does have an ironic sense of humor. A Facebook friend recently posted a link to the MIT OpenCourseware Site and I decided to take a look. Amazingly, MIT has an incredible number (over 2000!) of its course syllabi and materials available for perusal and use. There is also a special high school site which highlights introductory MIT courses and enrichment courses designed especially for high school students by MIT students. What does this mean for homeschoolers? It means that there is a wonderful resource for those planning on homeschooling for high school. These are pre-planned classes one can adapt to one's needs. Thank you, MIT!